So, what do you do when Valentine’s Day is approaching, and you cannot have eggs, dairy, wheat, soy, nuts, peanuts, chocolate/cocoa powder, sesame, coconut, or any non-fruit sweeteners, whether sugar or natural? Then, even planning for a nice dessert after dinner seems to out of the question, too. This was the problem presented to me this week, and I had to really think about how to make something which was free of everything but would somehow seem a bit special at the same time. Removing every other ingredient except for sweeteners would not actually be a problem. Removing all sweeteners, however, becomes a bit more problematic. Removing sugar from a cake means removing the ingredient which absorbs the moisture from the protein and carbs and which helps with the leavening process. This means your baked good will be more moist and dense simply by virtue of removing the sugar. Sugar substitutes like coconut sugar or agave, while not as efficient as sugar, can still do the same job. Once you are limited to only fruit, however, there’s not much you can do, other than to increase your dry ingredients and decrease the liquid but then the result may be a very dry dessert. As I considered options, I realized that sponge cakes are actually cakes which are made to be more dense on purpose and that maybe I could use the lack of a sugary sweetener to my advantage. In the end I created blackberry filled mini sponge cakes, using Polaner’s Blackberry All Fruit. While not chocolate, it is a different, which could be therefore be considered special. In a bowl, mix together the flour, baking powder, baking soda, cinnamon, nutmeg, ginger, cloves and salt. Set aside. Mix the ground flax seed with the hot water, and let it thicken. In a large bowl mix together the blackberry all fruit with the hot water and add to it the mashed bananas, oil, and vanilla. Add the thickened flax seed to the wet ingredients. Add the dry ingredients to the wet ingredients with the vinegar and mix just until blended. Evenly divide the batter among the muffin cups. Bake in the preheated oven for 20 minutes until the cakes puff and a toothpick inserted in the center comes out clean. Remove the mini cakes to a cooling rack and allow them to cool. 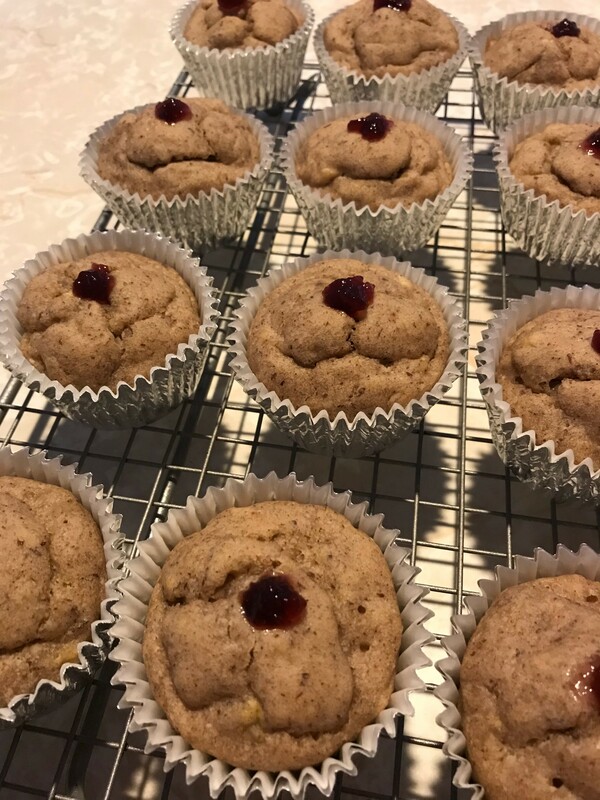 After the cakes are cooled, fill a pastry bag with a round tip with blackberry all fruit, insert the tip into each cake until the tip is hidden by the cake, and then slowly squeeze the all fruit into the cake until the cake puffs. Slowly pull the cake tip out and fill in the remaining space with all fruit, just ’til a little bit of the all fruit is peeking out of the top of the cake.